Bletoppen or Store Ble is the highest point on the mountain called Blefjellet. 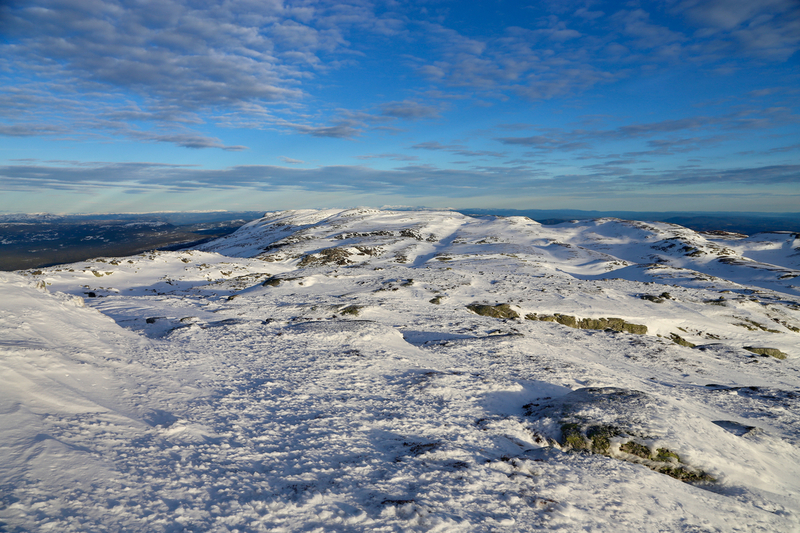 This is a popular mountain near Kongsberg. There are many access roads, but the most direct access to the highest peak is from the south side. 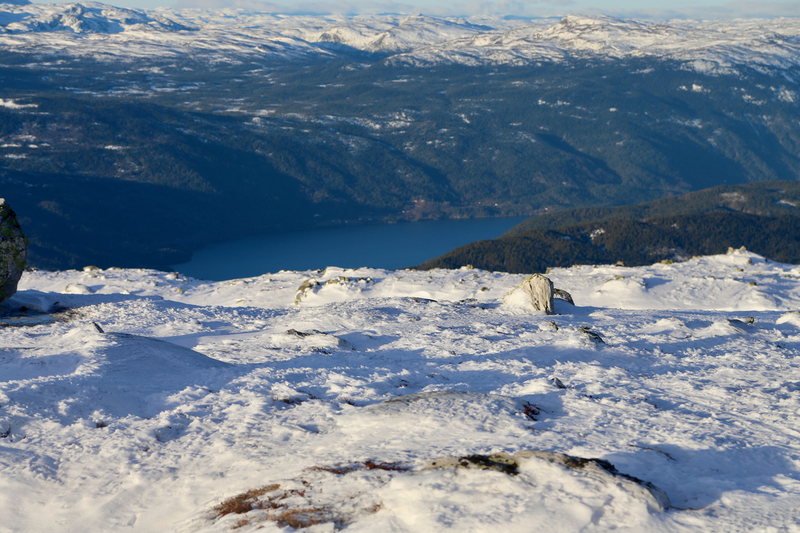 From Kongsberg, go north on Hwy. 40. Aftr only a few kilometer, locate Hwy. 37, signed for Rjukan that forks left. Take this road. Drive to the small place called Bolkesjø and continue about 3 more kilometer. Locate a signed road forking right with a sign for Store Blefjell, this road goes up to a place called Nordstul. The road is a toll road, pay by credit card (NOK 70 in 2017). At the end of the road there is a large parking area, location N59.77701, E009.21878, elevation about 725 meter. Park here. There are several routes. A pretty direct route runs up northwest to the lake Nordstulvatnet (746m), then north up a valley (Langedalen) to elevation about 960 meter, continue left in the valley fork (still Langedalen) until you reach about 1160 meter of elevation. The route continues up a bit more steeply through a distinct col near 1200 m just north of point 1224, then turns more north into a small valley named Bledalen that runs on the east side of the summit. Continue north until you can gain access to the north ridge, turn sharply and follow this broad ridge southwards to the summit. 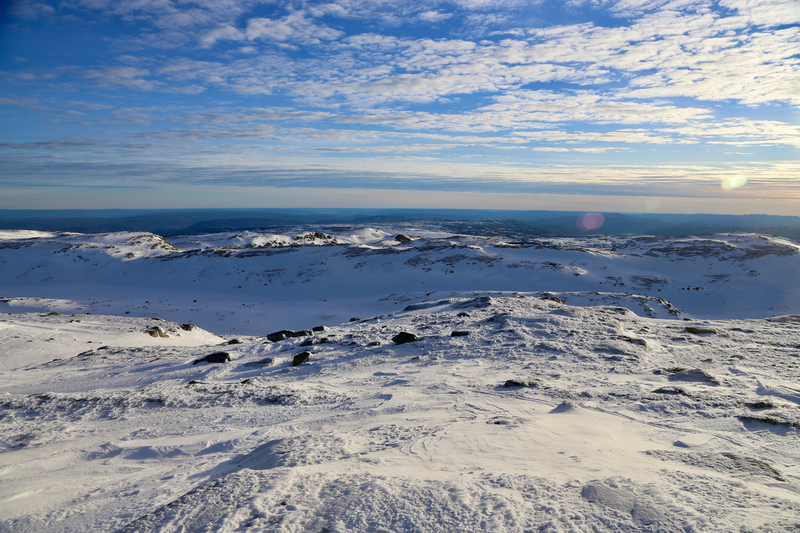 I had started the day at Geilo, then driven down the Numedal valley making a stop to climb Skagsåsen (972m) along the way. I then continued to Nordstul parking, arriving there after dark around 1700. 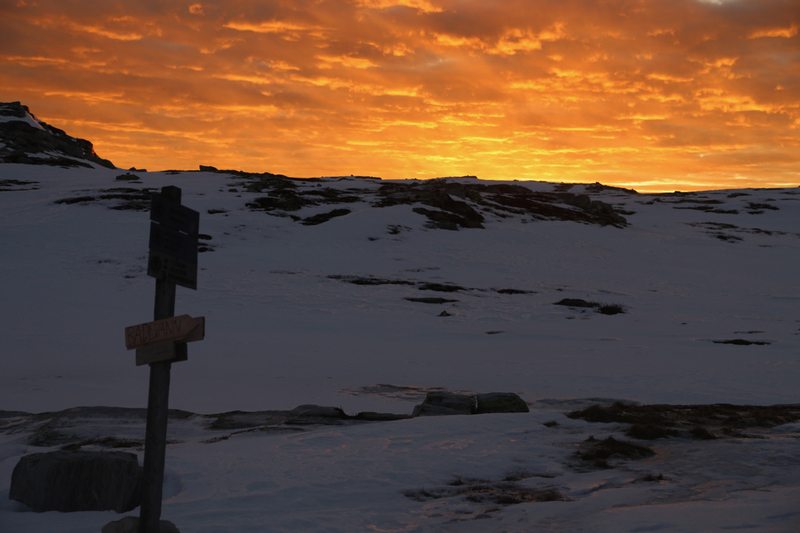 I had planned to ski to the self-serve DNT hut named Sigridsbu and stay there to Saturday. The snow cover was indeed very marginal. I skied up to the first lake, then continued uphill on the east side of the valley following some ski tracks. The tracks gradually vanished and I ended up skiing across some slightly complex area with sloping sides and too many trees for comfort. Entering the Langedalen valley, I continued uphill staying uphill on the left (west) side of the valley floor. Again, the snow was simply missing in several places. Getting higher, I skied into gale winds and generally less than good weather. 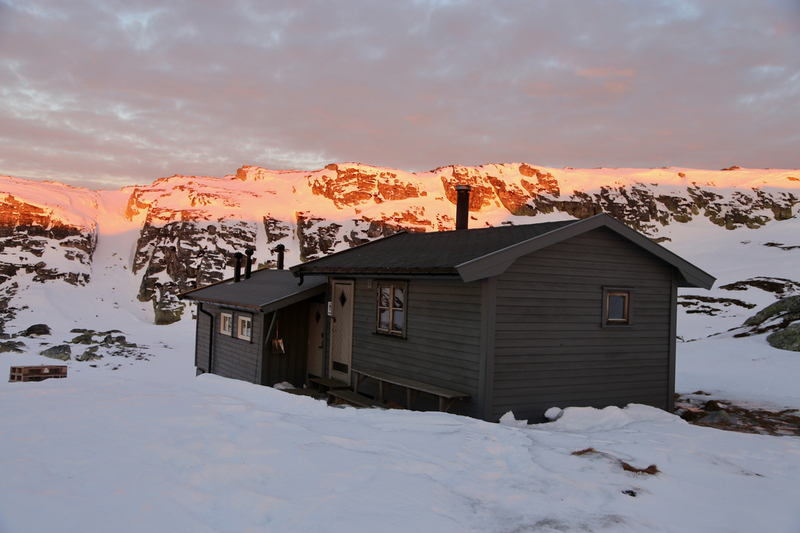 It was nice to arrive at the Sigridsbu hut around 1930, this distance should normally take less than 2.5 hours. The next morning came with nice weather. The wind had died down and the sky looked good before sunrise. 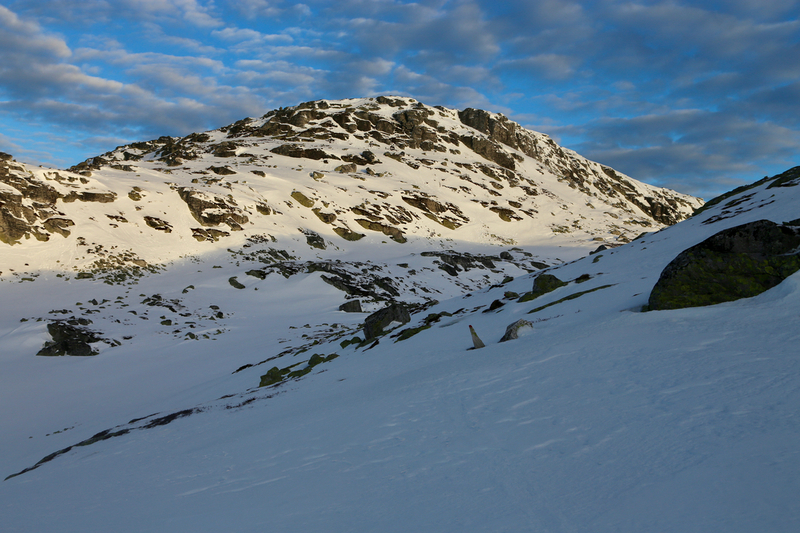 I left Sigridsbu around 1000 and had a very nice ski to the summit, arriving there about 1045. 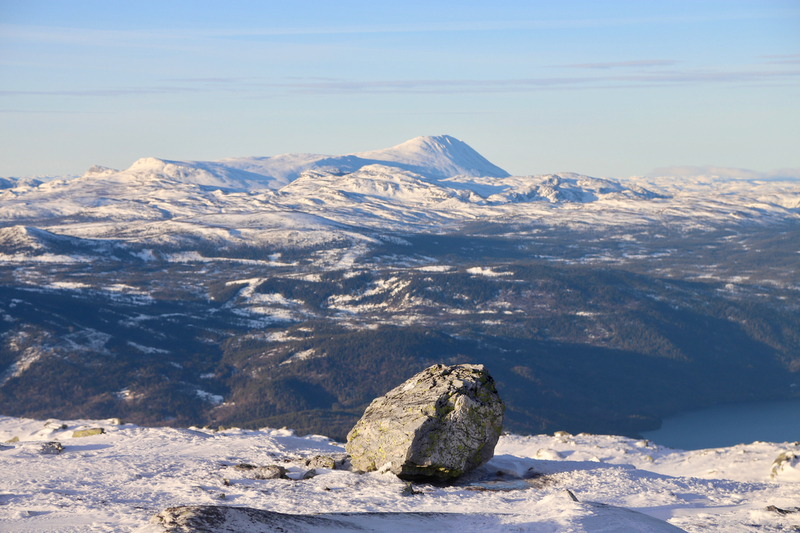 Good views across to the Gaustatoppen as well as down to the big lake Tinnsjøen. The main area of Blefjellet continued north. 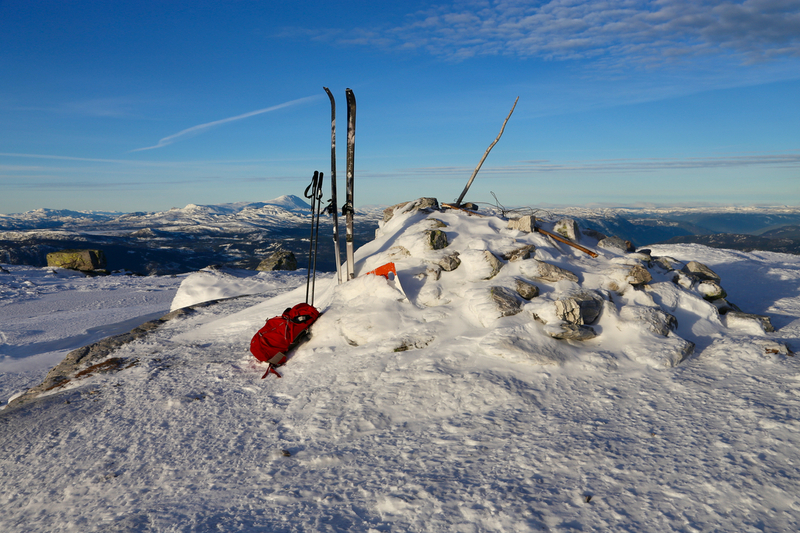 I decided to ski that way and visit the north summit called Nystulnuten. View east, no mountains this way.